The U.S. Occupational Safety & Health Administration (OSHA) is the primary reason aerial lift and scissor lift certification and training exist in the first place. Without OSHA, there wouldn’t be any government agency to enforce training standards, safety policies, and other important rules and regulations related to safety in the workplace. OSHA was formed way back in 1971. Thus, OSHA is older than many aerial lift and scissor lift operators working today – perhaps including you! Since the early 1970s, OSHA has steadily increased their safety guidelines for aerial lifts and scissor lifts. But how often do these updates occur? And what are some of the milestone safety updates that have impacted scissor lift and aerial lift use? The safety experts here at AerialLiftCertification.com went back through the history books, legislation records, and other documents to find some interesting answers for you! Since we’re always staying up to date with OSHA legislation changes and tweaks to safety rules, we have a better idea than everyone else about OSHA’s safety updates. That’s just one more reason why your company should sign up with AerialLiftCertification.com today. One of the most significant changes to OSHA occurred in 1979, when the government agency began seeking criminal prosecution and lawsuits for fatal workplace accidents. Prior to the late 1970s, OSHA was regarded by most companies as a safety guideline more than anything else. 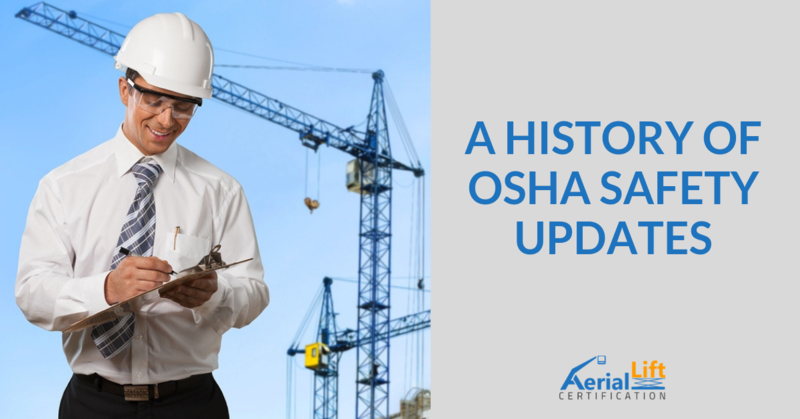 From the early 1980s and to the present day, OSHA has continued to evolve as a workplace safety advocate. From promoting college graduates with scientific degrees as safety inspectors to mandating warning labels on hazardous substances, OSHA’s reputation really took hold in the 1980s and 1990s. Thanks to aggressive inspection and audit techniques – most accidents involving aerial lifts and scissor lifts received inspections – many companies were forced to take safety more seriously. While OSHA handles safety for all U.S. companies, they’re better known for their safety guidelines for typical “blue collar” workplaces, such as warehouses, construction sites, and other jobs that use heavy-duty industrial equipment. For a comprehensive overview of OSHA standards, don’t miss their Scaffolding eTool, which offers a complete rundown of safe operating methods, applicable OSHA safety rules, and other information. Stay on Top of OSHA Policy Updates with AerialLiftCertification.com – Sign Up Today! Imagine running your own safety program, all the while staying current with the latest OSHA safety guideline updates. That could be a significant burden on your HR department, safety coordinators, aerial lift operators, and others. Let AerialLiftCertification.com do the heavy lifting for you. Our three courses automatically reflect any OSHA regulatory changes. If you had to track OSHA updates yourself, you’d most likely miss key safety knowledge. With AerialLiftCertification.com, you have everything you need to become OSHA compliant. That goes for both employees and employers! We’re here to help with any questions you have. Call us directly at (888) 278-8896. If you’re ready to sign up and get started today, congratulations – you’re making an important (and necessary) step toward greater safety and 100% OSHA compliance!